It has been brought to my attention that it is silly that Mr. Knights's blog has more updates on my modeling then my own blog. I think it is just sheer laziness, but I guess we can agree to disagree on that point. Anyway, by popular demand, over the next few days, I'll post all the action. 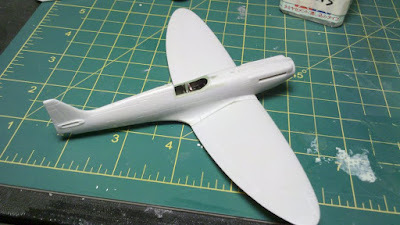 The Airfix Spitfire XIX had some masking tape seat belts installed and an instrument panel downloaded from 3D-Kits.co.uk was printed and glued to the bulkhead. Not looking too bad, and I think the downloadable instrument panel is a great idea. Especially for the newer Airfix Spitfires where a decal was inexplicably forgotten. The wings were then added. I've seen some comments on the web from modeling luminaries that they built this kit without any filler. I'm not so lucky. 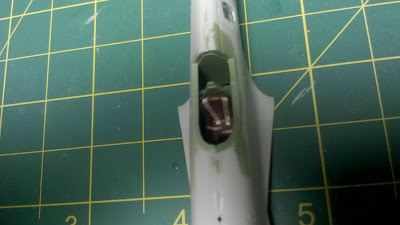 I'll need some on the wing root and the rear fuselage to wing juncture, but nothing a little Mr. Dissolved Putty can't fix. Heck, at this rate I might even get some paint on it this weekend.